Homemade crepes topped with a simple berry sauce made from Blackberries, Raspberries and Blueberries then stuffed with lemon ricotta filling! 1) Whisk together ingredients (except melted butter) in a medium bowl. It should be a very thin batter. Let sit for at least 15 minutes. Then stir in melted, but cool, butter. 2) Add a small dab of butter to a large nonstick skillet and swirl around over medium heat until melted. 3) Pour in about 1/3 cup of batter to the pan and immediately swirl the batter around to spread it around the pan in a thin layer. Cook for about 90 seconds on that side. 4) Flip crepe carefully with a thin spatula and cook for another 30-60 seconds on the second side until it’s lightly browned. 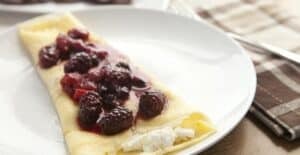 5) Smear crepe with some of the ricotta filling and top with berry syrup. For the ricotta filling, stir together ricotta and lemon zest and set aside. For the syrup, wash berries and combine them with other ingredients in a small pot over medium heat. Stir until the mixture is just starting to bubble. Then kill the heat and let he syrup cool. You don’t want the berries to completely break down from over-cooking. Serve crepes with sauce and sprinkled with powdered sugar. This delicious recipe was brought to you by Macheesmo. Read the full post at https://wp.me/pkSYO-9oH.